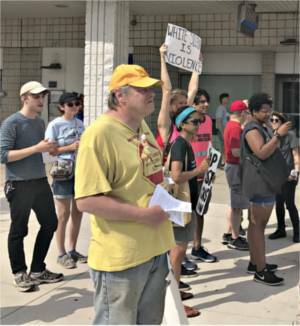 Activists rallied in Detroit’s busy Eastern Market on Saturday morning, June 17, to condemn the attempted murder of a homeless Black man in broad daylight by white supremacist thugs. Members of Workers World Party and the Michigan Peoples Defense Network called the action to condemn the heinous hate crime. On June 1, three racists attacked Randolph Davison as he was sitting outside a mental health treatment center in the historic Eastern Market commercial district of Detroit. The attackers shouted the n-word and repeatedly stabbed and slashed Davison with a knife. Local corporate media described the attack as a “jumping” in which Davison was supposedly stabbed in the leg. However, Davison revealed multiple gashes across his chest at a June 13 press conference held to announce the rally. Organizers say the attack was a hate crime of attempted murder and should be treated as such by the authorities. But, despite heavy security camera coverage of the area, Detroit police have announced no suspects and have made no arrests in the case. The knife attack mirrors other recent white supremacist hate crimes across the country, including the racist murders of Black men in New York and Maryland, as well as the murder of two bystanders who intervened against a white supremacist in Oregon. Activists gathered at the corner of Russell and Wilkins streets in Eastern Market and distributed leaflets condemning the attack on Davison. Speakers analyzed the attack in the context of the gentrification of the Eastern Market area. Under the guise of Detroit’s “revitalization,” the Detroit city government and the wealthy developers that control the city have used Eastern Market, one of the largest farmer’s markets in the U.S., as a tourist attraction for whites coming from the well-off Detroit suburbs and elsewhere. Speakers and protesters said that a hate crime as brazen as Davison’s attempted murder could only have happened in an environment in which racists feel emboldened. Gentrification, along with the racist green light coming from the U.S. president and his cabinet, have provided that environment in Detroit, a majority-African-American city. Activists also contrasted the police response to the attack to the fast arrests of graffiti artists in gentrified areas of Detroit, who are quickly identified via video surveillance and charged. Following the rally, protesters marched down the main thoroughfare of Eastern Market, disrupting the shopping and brunches of market goers and chanting anti-racist messages as well as “Justice for Randolph!” Several passersby joined the march. Detroit police harassed the marchers, at first falsely claiming protesters had no right to assemble on a public sidewalk and then denying that the hate crime ever took place. Several pro-choice clinic escorts also joined WWP and MPDN members at the action.